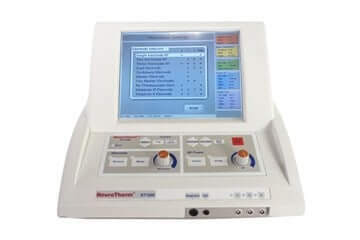 The Neurotherm NT1000 RF generator sometimes called a lesion generator, RFA or a pain management radiofrequency ablation generator can be used with up to 3 RF electrodes simultaneously. It was built to offer a full range of features and functions desired by all types of pain management physicians. We have several Neurotherm NT 1000, NT 1100 and NT2000 systems in stock and ready to go.with warranties and at very low prices. With the Neurotherm NT1000 RF generator, you get to choose 1, 2, or 3 RF Probes. Using multiple radiofrequency electrodes can greatly reduce procedure time. Each RF probe can be activated individually and the results for both sensory and motor stimulation are displayed in an easy to read format. Each threshold remains displayed on the screen for comparison and future reference. Operating time is greatly reduced when thermal lesioning or when using pulsed RF by simultaneously applying the RF power to 1…2…or 3 electrodes all at the same time.1 Each electrode is individually monitored for temperature, impedance, voltage, current and power and the readings are displayed on the screen. Use one, two or three RF Probes in any combination of length or tip size. They do not have to be all the same.